The centre encompasses three themes in which we have strength and depth: health, disease and nutrition that will allow us to take, uniquely, an interdisciplinary "farm to fork" approach. 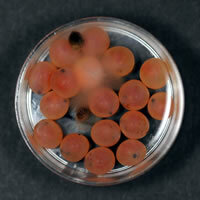 An essential requirement in aquaculture is the need to maintain healthy fish. This can be achieved in many ways, with manipulation of the immune system by vaccination or administration of immunostimulants (IS) an important means to achieve this goal. Studies at ICARD are focused on elucidating the mechanisms that protect fish against infectious diseases, and to use this knowledge to optimise future vaccine formulations and IS delivery. 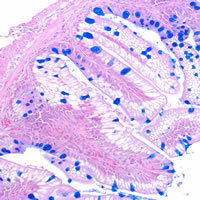 On-going projects include a number of vaccine development programmes, evaluation of alternative adjuvants for inclusion into fish vaccines, characterisation of the mucosal immune system to aid future oral delivery of vaccines, and assessment of the potential of functional feeds and feed additives to enhance resistance and decrease the pathology associated with disease states. 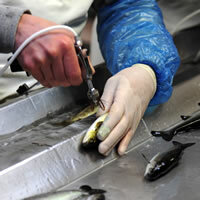 The most important factor restricting growth of the aquaculture sector is disease. There are many pathogens of algae, shellfish, crustaceans and fish that cause devastating diseases in aquaculture and in the environment. Research at ICARD is focused to investigate the disease process of several economically important pathogens. Our studies involve oomycetes (fungal like organisms), true fungi, parasites, bacteria and viruses. We study their taxonomy, ecology, epidemiology, lifecycles, (molecular) infection processes and pathogenicity with the overall aim to develop novel sustainable control strategies. Feeding of fish is the largest single cost to any finfish aquaculture. It is essential the diets meet the fish’s requirements and also be regarded as environmentally sustainable. Most commercially farmed fish are piscivorous (eat other fish) and historically diets have been based on unsustainable wild fisheries to supply these feeds. The raw materials of fish feed have changed dramatically in recent years reflecting the increased use of plant derived proteins and oils that are replacing the wild sourced fishmeal and fish oil. In order to ensure good fish performance on these diets a number of biological challenges are met, these include ensuring no negative impacts of the proteins and oils on the fish metabolism. As well as ensuring good growth and digestibility, research at ICARD also address functional feeds, such diets are designed to improve health and potentially reduce the susceptibility to disease. Finally researchers are examining the human health benefits of consuming farmed fish. Aquaculture has the potential to take the pressure off wild fish stocks whilst meeting the dietary needs of the population for omega 3 fatty acids and other key nutrients such as vitamin D. However, there is a need to understand the link between methods of production and the health giving properties of fish, making the final link from farm to fork.